My wife gets weirded out by any cut of meet with bones in it. This is mainly because it reminds her of the fact that she is indeed eating an animal that probably had feelings. Tearing meat off of bones with your teeth seems a bit savage in her book so needless to say I go without wings and ribs far longer than any man should ever have to. Having a craving for lamb over the weekend and knowing a chop would be a tough sell, I decided to go on the offensive and find a way to make lamb friendlier. Step one was to create something familiar enough to put her at ease. A grilled lamb burger was the easy solution. With ground lamb cropping up more and more at our local grocery stores, this was more convenient than you'd think. 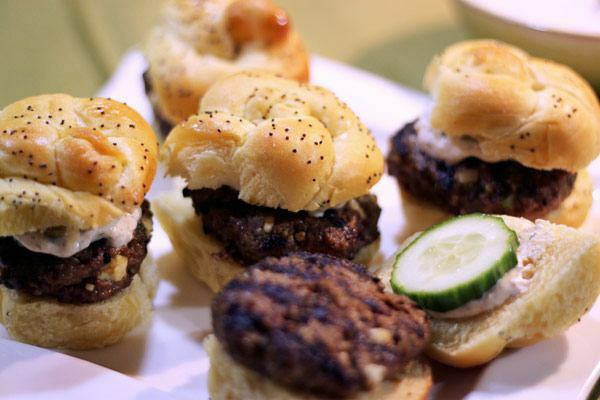 Step two was to shrink the grilled lamb burger down to the slider size that's all the rage these days. This ensured the end result would look cute enough to pass the wife test. For seasoning I pulled in some spicy mediterranean flavors that lend themselves to lamb. The grilled lamb burgers will have a little kick so I created some simple cucumber yogurt sauce to balance out the spiciness. These spices worked perfect and were all ones I had readily available. This really simplified things and made this a quick and easy meal. 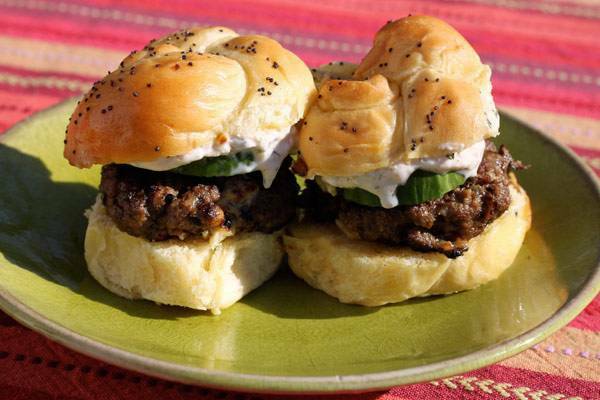 These grilled lamb sliders would make a party snack and you could easily convert it over to regular sized burgers should you feel the urge. 1Your lamb sliders are going to cook pretty quickly on the grill so its probably a good idea to crank out the cucumber sauce first. Cucumber yogurt sauce is a staple item in the Middle East and varies from country to country on the type of herbs and spices used and has a few names. Most people think of the Greek version called tzatziki but this version may be closer to the Turkish variety which calls for mint and dill. 2Cut your cucumber in half, reserving the unused portion for garnish. Peel and deseed your cucumber half and then grate it into mushy goodness (trust me on that one). Squeeze out the excess water and pat dry with a paper towel. Finely chop fresh dill and mint and mince the garlic. In a medium size bowl combine yogurt and all yogurt sauce ingredients and mix well. 3Mince green onions and garlic. In a large size mixing bowl, combine all the burger ingredients. Gently mix until feta cheese and spice is evenly distributed throughout. Scoop out enough to make a slider (roughly 1/8 of mixture) and form into ball. Gently compress balls into patties and firm up the edges to ensure they stay together on the grill. 4Grill sliders on medium high heat roughly 3-4 minutes per side. Remember these are sliders. If you are making larger/thicker patties for full sized burgers your cooking time will be closer to 6 minutes per side. Remove from grill and cover with aluminum foil while you get ready to assemble. 5Cut your remaining cucumber half into 1/8 inch thick slices, making sure you have at least one for each slider. Place grilled lamb patty on bottom portion of bun. Spoon cucumber sauce onto the top portion of the bun and place a cucumber slice on top. Slap the buns together and get ready for deliciousness. 1If you are looking for other ways to enjoy lamb on the grill be sure to check out how to grill a leg of lamb on a grill rotisserie and our classic post on grilling rack of lamb.